By age 8, Flavio Estrada was picking tobacco in the fields of Mexico. He yearned to join the other little boys and girls going to school, but his family couldn’t afford it. He never got the chance. Fast-forward 46 years: His daughter Daniela, a UCI political science major, will graduate this June with high honors and has been named a Fulbright and a Truman scholar. Daniela Estrada, 22, says her father’s words and both her parents’ hard labor have provided powerful motivation. Combined with an array of mentoring and other resources offered by UCI, it has put her on track to achieve what was once a “faraway dream” to be a lawyer. She is one of many people thrilled that UCI has been designated a Hispanic-serving institution by the U.S. Department of Education for 2017-18. That means fully one-quarter of undergraduates identify as Latino, and half of all students are recipients of financial aid. The classification opens up possible federal grants for tuition assistance, facility improvements and critical programs for everyone on campus. 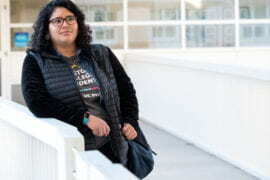 “It’s incredible, and it’s very well-deserved for UCI, which has done so much for first-generation students like me,” says Estrada, whose parents both emigrated from Mexico and became U.S. citizens via President Ronald Reagan’s amnesty process. Half of all undergraduates here now are the first in their families to attend college. 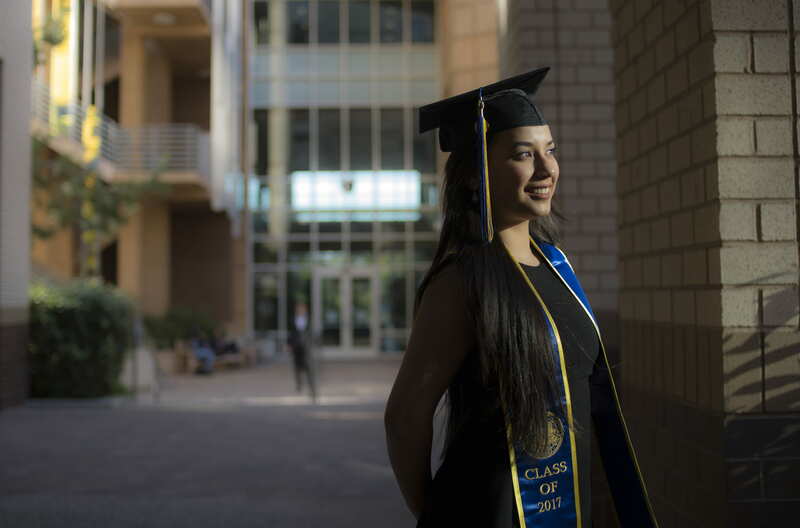 Current Hispanic enrollment is 25.7 percent, double what it was a decade ago, and UCI received more Chicano/Latino freshman applications for next fall than any other UC campus. “Latino students represent some of California’s most talented and promising high school graduates, chiefly from Los Angeles, Orange and San Diego counties,” Haynes says. 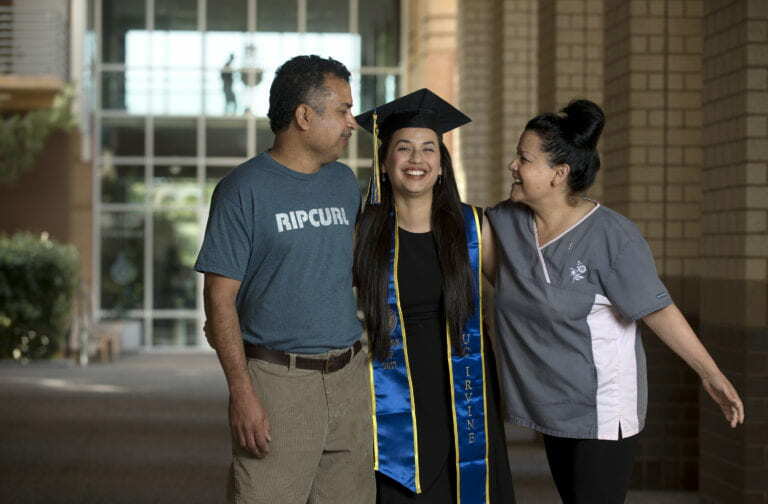 The major growth in Hispanic enrollment at UCI is the result of a concerted effort, including years of structured help for high school students across the region on which courses to take and the college application process. On campus, there are dozens of scholarship, internship, mentorship and leadership development programs. Estrada transferred from Golden West College to UCI as a junior. 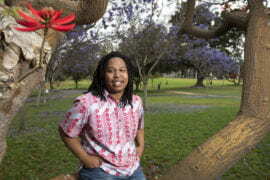 She loved the campus’s big, beautiful buildings and friendly people but was intimidated. Estrada had felt that before as the youngest child of working poor parents in a coastal resort town. She was stunned when she went to friends’ large homes to study and could see the surprise in their faces when they came to her family’s rented apartment. Her father arrived in the U.S. seeking work at 14 and has been a cook at Huntington Beach’s popular Sugar Shack Café for decades. Her mother, Estela Estrada, does laundry at an assisted-living facility. “I have seen my parents work long hours doing manual labor my entire life,” Daniela Estrada says. With his guidance, she traded her low-wage clothing store job for a paid summer research fellowship that opened up myriad opportunities on campus and beyond. “Like many students, I saw in her the kind of heart for the sort of work that she wants to do, and frankly, I pushed her,” Petracca says. This July, Estrada flies to Colombia to begin her Fulbright project, teaching English in the nation’s capital. When she returns, she plans to attend law school and become a public defender to help indigent people accused of crimes. 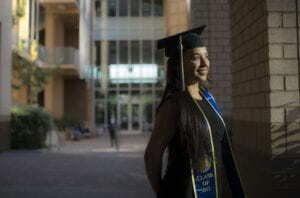 She was the only University of California student – and one of just two Californians – selected last year for the prestigious $30,000 Truman Scholarship, awarded for graduate studies related to public service. Estrada’s path wasn’t easy. Many first-generation college students experience loneliness and self-doubt, and motivation and grades can suffer the first semester, according to published research. Quick intervention can make the difference. In her case, the SAGE Scholars Program provided friendships, counseling and invaluable support. “I had this faraway dream of wanting to be an attorney. It seemed impossible. A classmate told me about a clerk job at a law firm, but I was so intimidated,” she recalls. Estrada explained to the SAGE director that she wanted to apply but had nothing to offer. He set her straight. “You can do this,” he said – and then coached her through preparing a resume. While others groan about casework and court time, she’s entranced. Stanford University data published this year shows that UCI is one of the top four colleges in the nation whose students experience huge income growth after graduation. 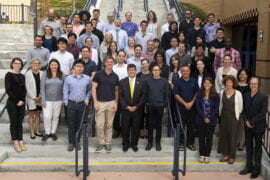 Anita Casavantes Bradford, UCI associate professor of Chicano/Latino studies, says that Estrada’s transformational journey reflects a key role played by the University of California and other colleges: as engines of social mobility that educate a workforce and create critical thinkers to play key roles in a democracy.